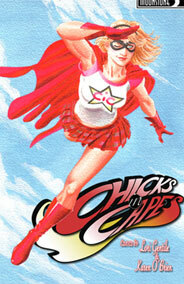 Chicks in Capes is fun and though-provoking collection of all-new prose short stories by a wide range of female authors, including New York Times bestselling authors Nancy Holder, Debbie Viguie, and Jennifer Fallon, along with comic book her-storian Trina Robbins, and a host of other popular fiction and comic book contributors. All of the stories are about super heroines, many characters created exclusively for this collection, and all contributors are female, including the interior illustrator, the cover artist, and the editors. Strong female super-heroine characters from all walks of life are included in this stellar anthology: a parking valet, an archeologist, a bike messenger, a nurse, a holocaust survivor and many more. There is something for everyone is this anthology: action, adventure, drama, romance, science-fiction, and more!